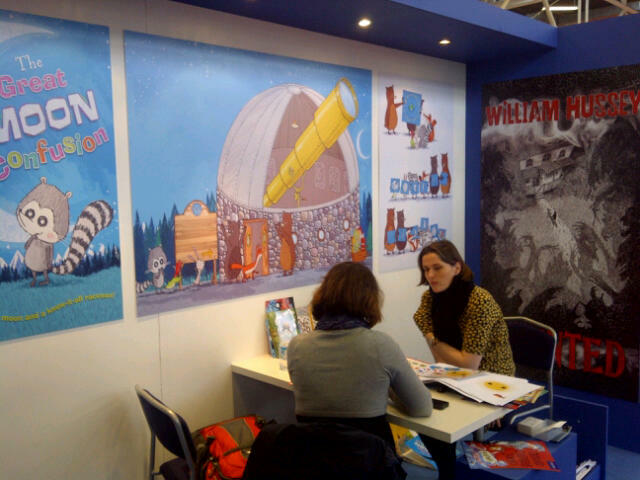 The Bologna Children’s Book Fair is now in full swing. From Monday to Thursday this week our rights team have scheduled meetings every 30 minutes from 9.00am till 5.30pm with children’s editors from around the world. It’s our chance to showcase the OUP titles that we are planning to publish over the next year or so with the aim of selling them the rights to publish our books in their own language. It’s so busy the rights team barely have time to schedule in a loo break! 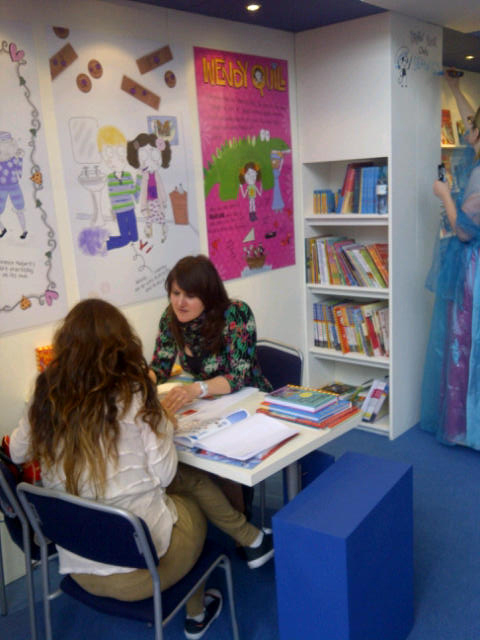 The fair takes place often before the books are published in the UK so, here is the rights team in action presenting proofs and ‘dummies’ – artwork that is run out on the colour printer and stuck into blank books of the right size and shape supplied by our production team from our printers. Head of Rights Anne-Marie Hansen. In the background you can see displays for picture book The Great Moon Confusion from Richard Byrne, and Haunted, a chilling new book for teens from William Hussey. Zuzana Miyahara Kratka, Rights Manager. 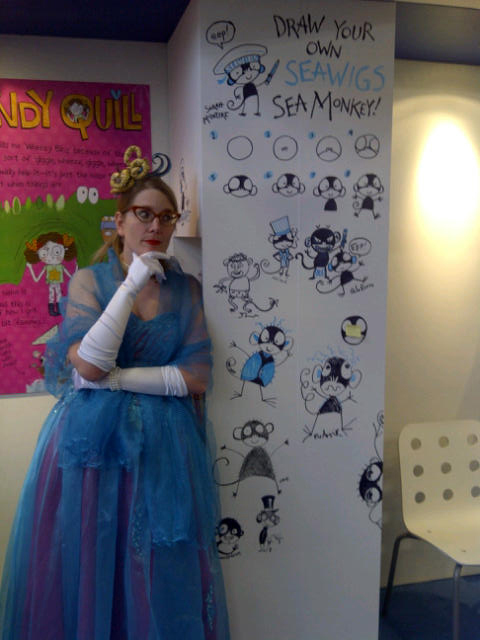 In the background is the hilarious Wendy Quill is a Crocodile’s Bottom, by Wendy Meddour and Mina May. While that’s happening, our editors are meeting with the rights teams of publishers from abroad who are presenting their titles to us. There are also meetings with other people interested in children’s books from film scouts and online sites to UK retailers and media. 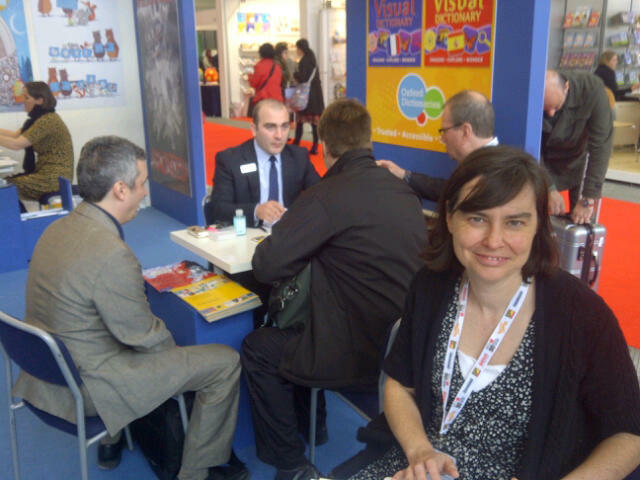 Here’s Head of Publishing Liz Cross in a meeting on the OUP stand. Our lovely designers have also been meeting with scores of potential new illustrators from around the world. This year we are delighted to host a special dinner for publishers who have already bought or are considering Oliver and the Seawigs, a new illustrated novel by Philip Reeve and Sarah McIntyre. Here they are drawing sea monkeys from the book all over the OUP stand and causing a stir as they stroll through the aisles at the Fair. 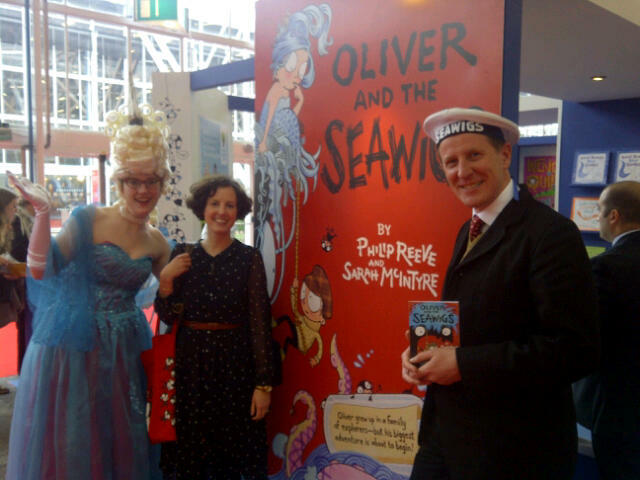 Sarah is resplendent in her ‘Seawig’ and, Philip, as elegant as ever, sports a Seawig sailor’s cap. This is one of the most important weeks of the year for children’s publishers. Selling foreign rights is hugely important to the industry and is often crucial to the success of a book – particularly colour publishing.